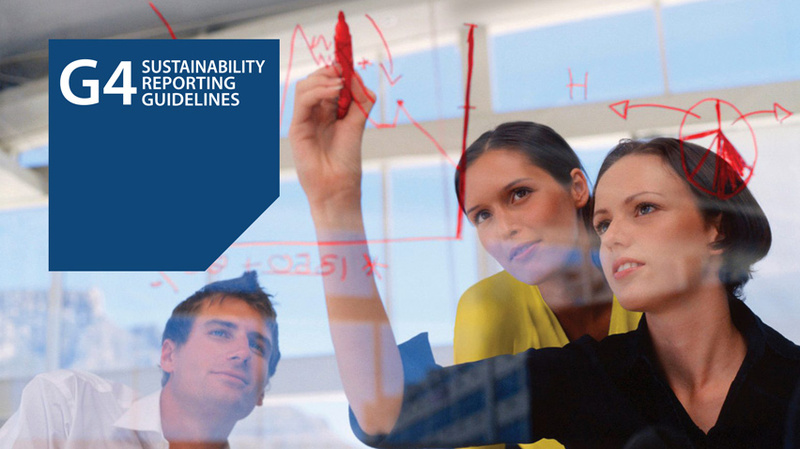 Shell conducts an environmental, social and health impact assessment for every major project. This helps us to understand and manage the effects our projects could have on the surrounding environment and local communities. engaging with communities to understand concerns they may have and discussing possible ways to address these concerns. These assessments help us manage and reduce potential impacts at all stages of projects. We also draw on international standards, such as those of the World Bank and the International Finance Corporation, to guide our engagement with communities. “Early collaboration with non-governmental organisations (NGOs) can help the energy sector more effectively manage its environmental impact, reduce project risk, and improve conservation planning. Shell’s coastal and offshore operations have direct and indirect impacts on coastal areas and fisheries. Addressing these impacts early in the project cycle must be a priority. Investing in fisheries management, including support for monitoring and enforcement, can mitigate impacts especially if the investment is in line with the severity of the impacts and delivers desired conservation outcomes. In Gabon, Shell provided the WCS and the government of Gabon’s marine conservation programme, Gabon Bleu, with data to improve planning and management of Shell’s seismic surveys and the awarding of local fishing licences. All this helped to protect tuna stocks in the area. indigenous peoples’ rights, cultural heritage and resettlement. 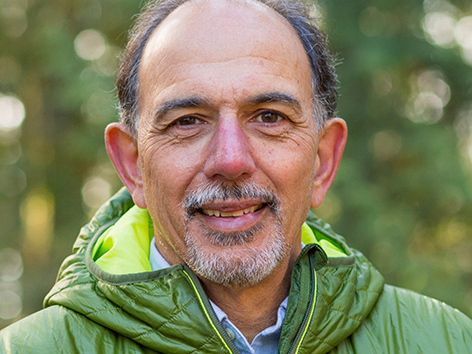 The specialists work with project teams to help manage potential impacts on communities or the environment during project design, construction and operation. At each review stage in the project development process, we decide if and how we are going to move forward with a project. This includes balancing short- and long-term interests, and integrating economic, environmental and social considerations into our decision-making. The results of all assessments are documented in a mitigation plan which is approved by the manager accountable for the project. The plan is updated and its implementation is monitored and reviewed throughout the lifespan of the project. 1Myanmar. Shell took steps to avoid impacts on the environment and people following a seismic impact assessment study. For example, we adjusted seismic lines after some fishermen raised concerns they would interfere with fishing areas. Shell also planned seismic activities to ensure they would not coincide with fishing times, to avoid collisions. 2Gibraltar. Shell selected an onshore development for a liquefied natural gas terminal in Gibraltar after impact studies identified it as the safest and most environmentally responsible option. The terminal uses waste heat from a power station to turn LNG back into gas. This mitigates environmental impact by minimising energy and water use. 3Philippines. 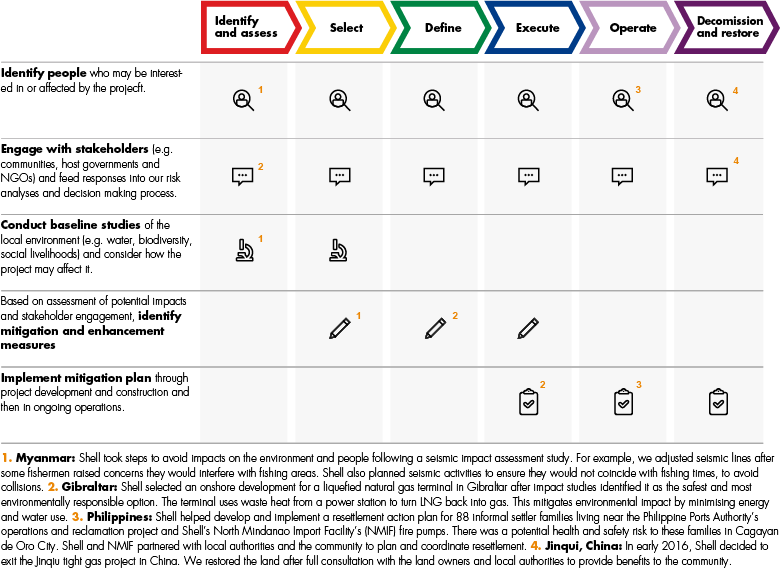 Shell helped develop and implement a resettlement action plan for 88 informal settler families living near the Philippine Ports Authority’s operations and reclamation project and Shell’s North Mindanao Import Facility’s (NMIF) fire pumps in Cagayan de Oro City. There was a potential health and safety risk to these families. Shell and NMIF partnered with local authorities and the community to plan and coordinate resettlement. 4China. In early 2016, Shell decided to exit the Jinqiu tight gas project in China. We restored the land after full consultation with the land owners and local authorities to provide benefits to the community. (See also Decommissioning and restoration). Identify people who may be interested in or affected by the project. Engage with stakeholders (e.g. communities, host governments and NGOs) and feed responses into our risk analyses and decision-making process. Conduct baseline studies of the local environment (e.g. water, biodiversity, social livelihoods) and consider how the project may affect it. Based in assessment of potential impacts and stakeholder engagement, identify mitigation and enhancement measures, e.g. change a pipeline route or reduce water used. Implement mitigation plan through project development and construction and then into ongoing operations.